Jump to a list of all Dutch castle hotels here, or click on a region. Haven’t decided on a hotel yet? You can look at other available hotels in the Netherlands with Booking.com. The Netherlands hosts a galaxy of castles across its landscape—nearly three hundred of them if you care to count. Some are magnificent structures, open to the inquisitive visitor; some are mere shells of their former glory, destroyed in the Eighty-Years’ War, never to recover. And some have lowered the drawbridge to accept overnight guests—you. You’ll find a wide variety to choose from: castles, palaces, a convent, and even a youth hostel, with all of them extending a warm welcome to everyone who loves history. Best of all, they are easy to get to, whether it’s by public transportation, private car, or even by bicycle. If you take the time to travel off the beaten track in this compact and industrious country, you’re certain to fall under the charm and hospitality of its castle hotels. What can I expect at a Dutch castle hotel? How do I get to a Dutch castle hotel? Is it possible to get married at a Dutch castle hotel? When is the best time to travel to the Netherlands? Every province of the Netherlands is delightful! 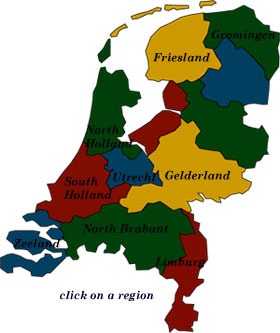 Friesland and Groningen Frisian kings once commanded the entire coast from Belgium to northern Germany. Today’s visitors come to Friesland to enjoy a sparsely populated countryside, lakes, and the West Frisian Islands—a UNESCO World Heritage Site. Spend any time in Groningen and you’ll discover moated manor houses, fortified towns, castles, windmills, and a university town filled with cafes and restaurants. At its heart, the province is peaceful and rural. Limburg and North Brabant By far, Limburg can boast of the greatest concentration of castle hotels in the Netherlands—reminders of the defensive response to the passing armies of history. In North Brabant (Noord Brabant), enjoy forests, moorland, and fens while discovering its rich historic past—marked by fortified towns and castles. North Holland Dominated by Amsterdam, one of the great cities of the world, North Holland (Noord Holland) is filled with everything you associate the Netherlands with: delightful and lively towns, windmills, brilliant bulb fields, seafront hotels nestled in the sand dunes, and historic buildings. South Holland and Zeeland In South Holland (Zuid Holland) a checklist of windmills, tulips, cheese, and Delft ceramics come straight out of a “Visit the Netherlands” tourism promotion poster. Two important cities: Rotterdam is one of Europe’s most active ports, and The Hague is the seat of the Dutch government and royal family, and headquarters of international organizations such as the International Court of Justice. With a name like Zeeland, the sea plays an inseparable role in shaping the lives and culture of the islands. Strips of islands jut across a vast delta, linked together by ferries, dams, bridges, and dykes. Utrecht and Gelderland Beyond its eponymous 2,000-year-old capital city, the province of Utrecht—the country’s smallest—offers castles, manor houses, farms and museums spread out over a landscape of scenic beauty. Heaths and woodlands make up just part of the natural landscape of Gelderland, the largest province of the Netherlands, but always nearby are the castles, churches, fortified towns, and World War II memorials that give witness to the province’s long history.